D-Day BeachesI always pictured the day I'd visit Normandy and the D-Day Beaches. It would be grey, overcast, windy - my hair would be whipping all around and it would be a totally somber feeling throughout the day. It was the exact opposite when I went. It was beautiful, sunny, bright, and a little too warm. You always think September weather in Europe will be cooler than it actually is (so I didn't need my new J. Crew jacket that I bought especially for this day!). I rocked my giant sunglasses and gulped cold water bottles. Normandy coastlineI wrote about how we eloped to Paris in my National Geographic column, which included the choice to do Normandy. We went with Context Travel (love! love! LOVE them!) and took a two-hour train ride to Caen to meet our amazing guide, Alexander Wilson, in Normandy. His dad landed there in June, 1944 so the personal connection was incredible to hear about. This was the tour we chose. Our guide, Alexander WilsonWhile the weather wasn't grey and cold, seeing Omaha Beach for the first time was as overwhelming as I thought it would be, especially seeing all the names and hometowns on the gravestones. Surprisingly, there were a lot of Walters - must have been a very popular name back then. I pictured who these men were - the Walters from New York and Chicago, John from Virginia, William from Pennsylvania. Picture the most beautiful beaches in the world - Omaha Beach is right up there! It used to be place for holidays and leisure. It was nothing like I had imagined it to be. Five beaches (Utah, Omaha, Gold, Juno, and Sword) were stormed and they occupy a 50-mile stretch. I thought it was one small beach. Seeing the geography of Omaha Beach made everything make sense from confusing history books & movies...how steep they had to climb and how hard it was. Walk 15 minutes down from the cemetary to the beach. Walk along the beach and look up. It is heartbreaking. That's why travel is better than any class, book, or teacher. I understand in a minute what is really difficult to comprehend. Soldier on Omaha BeachAnd finally - who the heck greenlit this monument's design? Can we say massive phallic symbol? It's located at Pointe du Hoc, where one of the most important D-Day battles occurred with U.S. men scaling the cliffs. James Earl Rudder has always been a name I've known - as 16th president of my university, Texas A&M, he was also a war hero and leader during this battle. 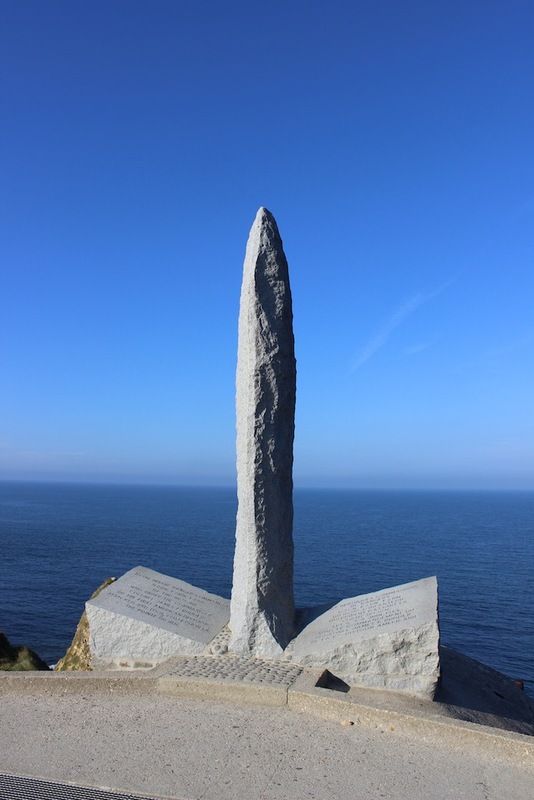 This truly odd-shaped monument is dedicated to him so we loved seeing it! I'll explore much more of Normandy the next time around - what did I miss?